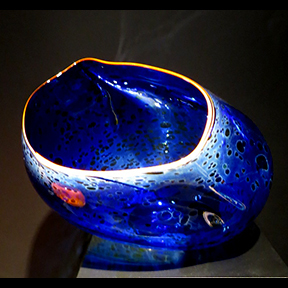 Inspired by Native American baskets, Chihuly first developed these forms in 1977. He wanted to capture the slumped, sagging forms of the woven baskets and he allowed heat and gravity to help him shape the glass. Initially he followed the earth-tones of the Northwest Coast baskets but later his palette exploded into exuberant colors. 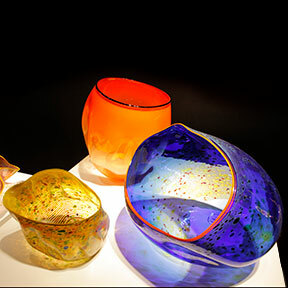 As the Baskets series developed, Chihuly stacked them together into sets and glass objects were placed inside the translucent vessels.